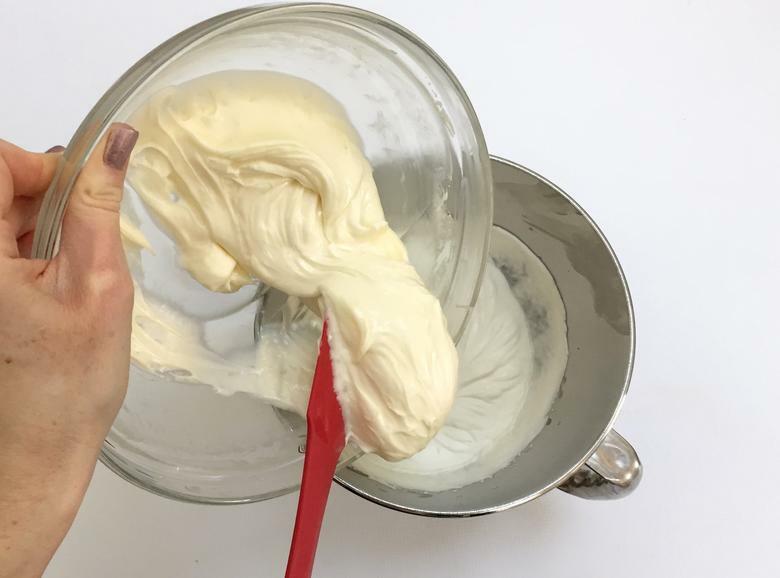 Today I’m going to share a light and flavorful Whipped Cream Cheese Frosting recipe! The light consistency makes for a heavenly filling, and also works well for swirling onto cupcakes. When it comes to cream cheese frosting, you can never go wrong. I love just about every variation we’ve tried! We have lots of cream cheese frosting choices in our Recipes section, but this is the first whipped version we’ve posted. SO good! 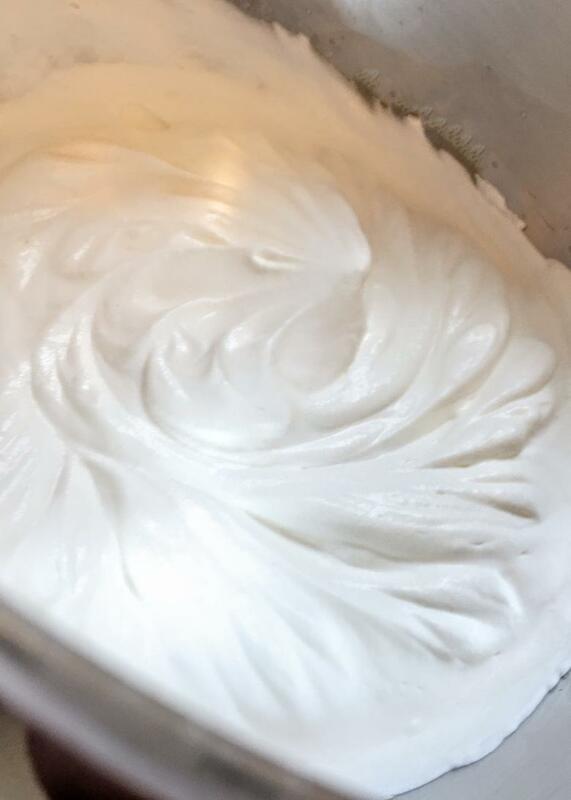 We don’t actually whip the cream cheese frosting, but instead incorporate a fresh batch of whipped cream into our cream cheese. 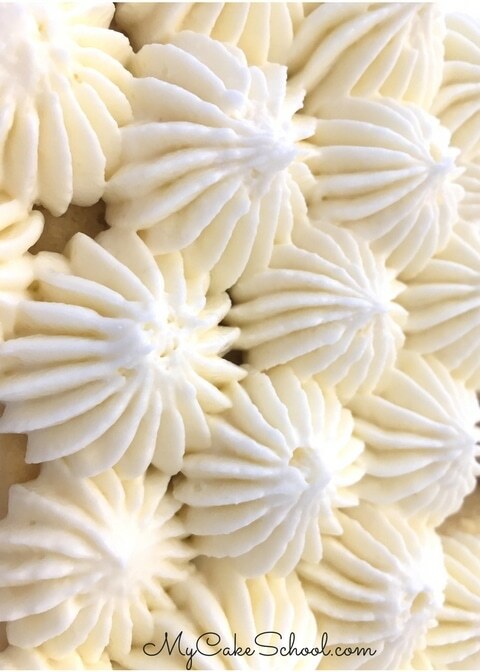 The result is a very light cream cheese frosting which very much resembles whipped cream (in a more stabilized form). The flavor is AMAZING, and it pipes very nicely although I wouldn’t recommend it for frosting an entire cake. It is just a bit to airy and doesn’t spread as easily as buttercream or cream cheese frosting would. However, it would be perfect for swirling onto cupcakes, or as a simple piped filling and topping on naked cakes. When piped with a large piping tip, it has a lovely billowy look and feel. 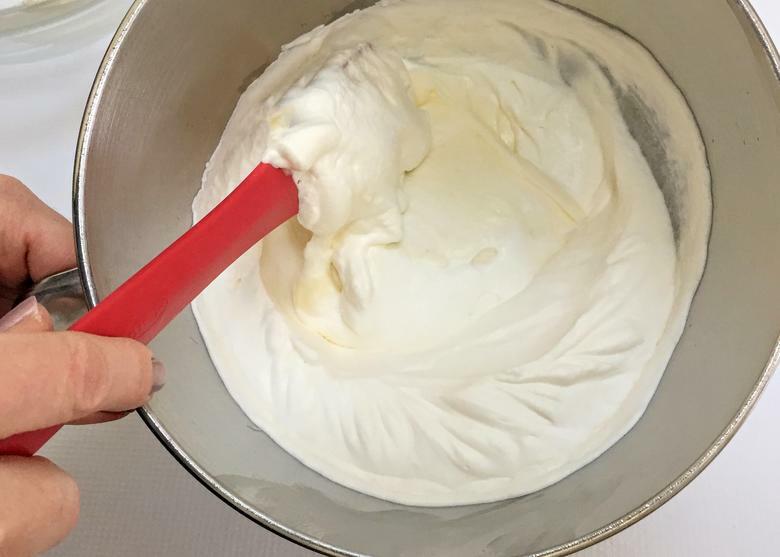 To make the frosting, we first chilled our beater and bowl, and then whipped the cream until stiff peaks formed. In another bowl, we combined the cream cheese, sugar, and vanilla. Beat until very smooth, and then gently folded it into the whipped cream. That’s all there is to it! 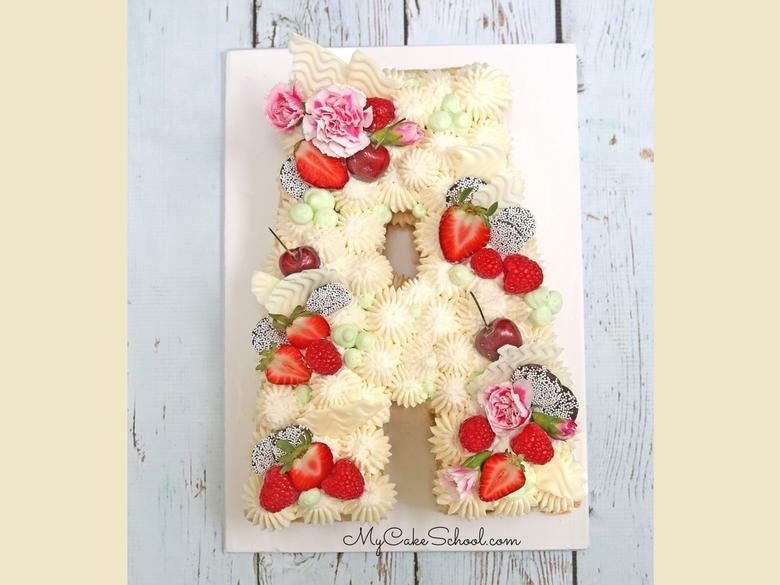 We used this recipe on our recent Alphabet Cake video tutorial (member section). You can see that it pipes perfectly! We hope that you enjoy it! Two 8 ounce packages (452g) cream cheese, softened. It must be full fat, not cream cheese in a tub or reduced fat, those are too soft. Chill your mixing bowl and beater before whipping the cream. Beat the whipping cream until stiff peaks. This can happen very quickly so don't walk away from the mixer. You are at the stiff peak stage when you lift the beater and the cream stands straight up forming a peak. Set aside. In another bowl combine the cream cheese, powdered sugar and vanilla. Beat until very smooth. Fold this into the whipped cream. Cover and refrigerate. If you are piping on this frosting and it becomes too soft, just refrigerate the filled piping bag for a short while. Use on your cake the same day it is made. We piped this frosting using a french tip Ateco 869 on our Alphabet Cake. The cake still looked good on the 3rd day though the frosting was very slightly deflated. Thanks for stopping by! Don’t miss our other fabulous cake, frosting, and filling recipes in our Recipes section! You can also find fabulous free cake tutorials in our Free Tutorials section. 2 8 ounce packages (452g) cream cheese, softened. It must be full fat, not cream cheese in a tub or reduced fat, those are too soft. Chill your mixing bowl and beater before whipping the cream. Beat the whipping cream until stiff peaks form. This can happen very quickly so don’t walk away from the mixer. You are at the stiff peak stage when you lift the beater and the cream stands straight up forming a peak. Set aside. In another bowl combine the cream cheese, powdered sugar and vanilla. Beat until very smooth. Fold this into the whipped cream. Cover and refrigerate. If you are piping with this frosting and it becomes too soft, just refrigerate the filled piping bag for a short while. Use on your cake the same day it is made. We piped this frosting using a french tip on our Alphabet Cake. The cake still looked good on the 3rd day though the frosting was very slightly deflated. Sounds wonderful! I just finished making a semi naked cake with fruit and buttercream. Good but I think the whipped cream cheese would have been better! Which amount of cream cheese is correct, printable version has 8 oz of cream cheese and the other on has (2) 8 oz of cream cheese? Hi Angelia, It is two 8 ounce packages cream cheese (452g). Thanks for letting us know. I have made the correction. Would I be able to use this recipe as a filling, and how far in advance could I fill the cake? I’m realistically looking at 2 days. Hi Tracy, This is an approximate amount depending on how high or heavily you frost the cupcakes. This recipe makes 7 1/2 to 8 cups of frosting. One cup of frosting will frost 12 cupcakes when piping a simple swirl. Of course, if you take the swirl higher, more is needed. As noted in the recipe, you should use this on your cupcakes the day it is made. Does this need to be refrigerated once frosted? Or is it stable at room temp? We never finish birthday cakes the day of. So does it need to be refrigerated after that? Hi Elizabeth, Yes, the frosted cake will definitely need to be refrigerated. The cream cheese as well as the heavy cream are perishable. Can you add gel food coloring to this? Hi Tasha, I haven’t tried tinting this frosting. My worry would be that it may deflate the frosting as you try to incorporate the color, but I can’t say for sure. Let us know if you give it a try! I do not find this recipe to be very sweet. Hi Cass, Your cupcakes look great!! I’m happy you like the recipe and thanks for posting your picture!